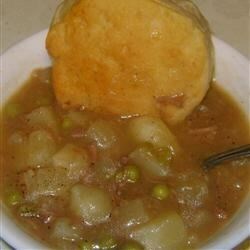 "This stew has vegetables and beef in a wonderful brown gravy. It is a great meal for a chilly autumn night!" In a large pot over medium heat, cook sirloin in oil until quite brown. Pour 1 cup of water over the meat and drippings and cook, stirring, 2 minutes, until a dark gravy forms. Stir in 3 cups water with the salt, lemon juice, paprika, garlic, sugar, Worcestershire and bay leaf. Cover, reduce heat and simmer 2 1/2 hours. Stir potatoes and carrots into simmering stew and cook until tender, 20 minutes. Stir in onions. In a small bowl, combine flour with remaining 1/3 cup water. Stir flour mixture into stew and cook until stew thickens. Top with peas just before serving. See how to make a classic Southern stew with pork, beef, and chicken. Fantastic!!!! Everyone loved this stew. I`ll use this recipe from now on. I think this recipe would be better if the fat and oil is drained after browning the beef instead of using it for gravy. The beef fat and oil sort of add a musky taste to the stew. This was good, I also put it in the crockpot & skipped the oil. It took a bit more flour & some cornstarch to thicken the gravy, but it was good. Thanks Debbie! This is the best stew I have ever had! The gravy is delicious. I will definitely make this again.